While in Kentucky, I took the opportunity to take a more in-depth tour of the Maker's Mark Distillery. It's called the Beyond the Mark tour and it costs $35 per person. There is a maximum of 12 people per session. My wife and I purchased out tickets ahead of time and didn't hear them offer it to anyone while we were waiting so it probably wouldn't hurt to do the same if you choose to do this. The tour starts the same way they all do. You cross the bridge and walk down the path, pausing along the way to hear a little bit of the history of the distillery from the time the land was cleared until today. We stopped off to peek inside the Quart House, the first liquor store in the state of Kentucky. Then we enter the distillery proper. Up to this point, the tour isn't that much different from the nine dollar tour. Smaller, more intimate, the tour guide seems more knowledgable (even acknowledging the gentleman who called her on the myth of the recipe origin with a sidelong, "hush, we'll discuss that amongst ourselves"). All in all, Aggie was the best part of the tour up until this point and the one thing that made it different. 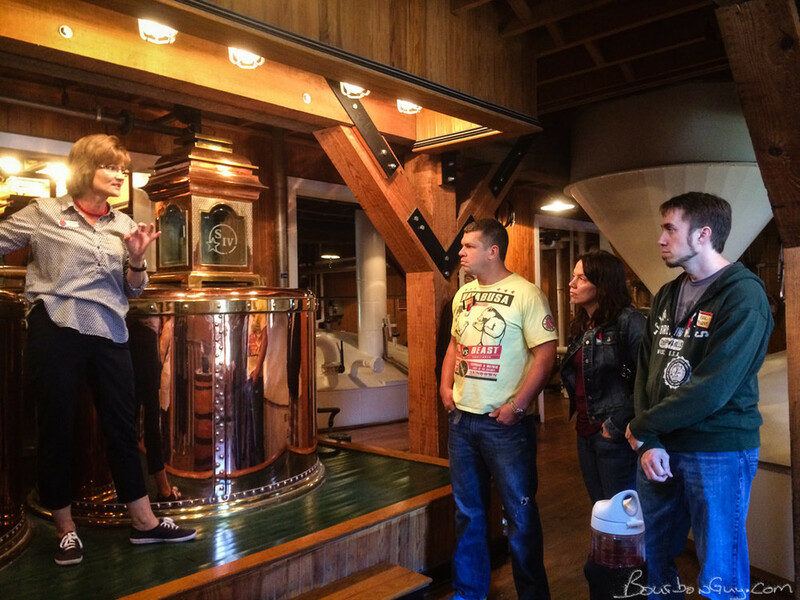 Everyone gets to see the stills and the tanks as they are beautiful. Not every tour gets to drink the white dog dipped out of that tank. I don't care for white dog, but this was too cool to pass up. But after that, we got to see the "real" fermenters. Not that the others are fake, but these are the 34 stainless steel ones that make the bulk of the mash. After the fermenters, it was up the stairs to have a very nice shift supervisor tell us about their yeast. It's hopped to keep the bacteria from taking it over. We got to taste it...tasted like a flat Belgian beer. Every tour gets to see the printing presses and die cut press that makes the labels. But this was the first time I got to enter the Quality Control Building. This was one of the samples. I didn't get to taste it and make notes, though come to think of it, I didn't ask either. The tickets in the background are prizes to incentivize the employees to participate. I guess when you are around bourbon all day, tasting it might be just...work. Gotta go through the warehouse. No distillery tour would be complete without that awesome smell. Watching the folks on the bottling line is always impressive. But going through the room where they dip all the specialty items and different wax colors was really cool. It was nice to see the "not-so-polished" side of Maker's. I've worked in factories and always knew it had to be there. I liked seeing it. No tour would be compete without a tasting. We got the standard four (Under-aged, normal, over aged and 46) plus a sample of the Cask Strength. 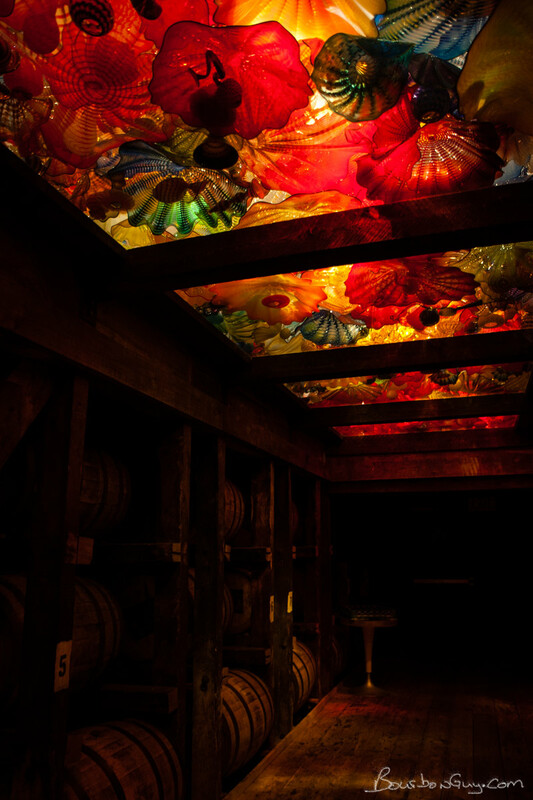 The Cask Strength which we toasted to one another under the light of the Dale Chihuly art installation on our way to the Gift Shop. Finish: good, long warmth that sits in the chest and a sweetness that hangs around, but then transitions to sharpness. Thoughts: This is Maker's just stronger and more concentrated. It's fabulous and well worth the equivalent of $80 for a 750 mL when compared to other cask strength offerings. It's very drinkable and I like it more than either regular Maker's or Maker's 46. This whiskey was money well spent and the tour even more so. I gathered a lot of knowledge from a very good tour guide. I got to see places and have experiences that I didn't normally get to have and got to geek out just a little bit. I'd recommend both.